Payment codes should be set up for all payment types accepted at your property. Before entering new codes, see List of Codes for required or restricted codes and special notes. 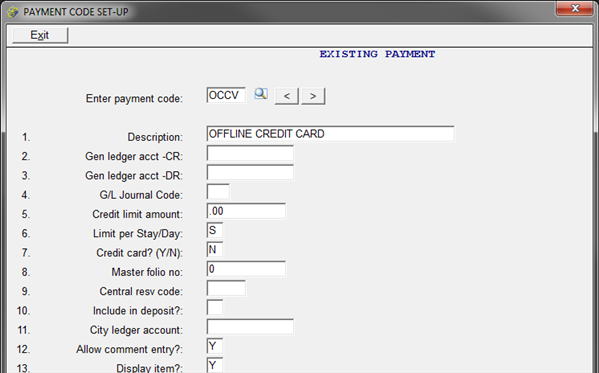 To set up new codes or look up existing codes, go to Manager/Setup > Hotel Control Files Setup > Payment Codes. - General payment codes include those for Cash, checks, wire transfers, and direct bill. "Enter payment code" up to four alphanumeric characters. NOTE: Case matters. "B" is not the same as "b". The first two character should be UPPER CASE letters since some codes are predefined. See List of Codes for pre-defined codes and special notes. If you wish to specify the sales outlet or revenue department you may make that part of the code but the first two characters must be the same. For example if you want Front Desk Cash, Restaurant Cash, Deposits Cash, and Spa Cash you may set up CAFD, CARE, CADE, and CASP. For Cash payment codes, the first two characters should be CA. If you have only one Cash payment code, CA is fine. You must use DB for Direct Bill if you are using the built-in Direct Bill features in Execu/Suite. "1. Description" can be up to 30 alphanumeric characters. This description will print on reports and folios. "2. Gen ledger acct - CR" is the General Ledger CREDIT account that transactions using this code should post to if you are using Execu/Tech's Back Office Accounting or one of our interfaces to a third-party general ledger system. If you do not know the account number to put in this field, you should consult your accountant. Execu/Tech offers no accounting service of any kind. "3. Gen ledger acct - DR" is the General Ledger DEBIT account that transactions using this code should post to if you are using Execu/Tech's Back Office Accounting or one of our interfaces to a third-party general ledger system. If you do not know the account number to put in this field, you should consult your accountant. Execu/Tech offers no accounting service of any kind. "4. G/L Journal Code" is the 2-character General Ledger journal code that transactions using this code should post if you are using Execu/Tech's Back Office Accounting or one of our interfaces to a third-party general ledger system. If you do not know what to put in this field, you should consult your accountant. Execu/Tech offers no accounting service of any kind. "5. Credit limit amount" sets the default credit limit amount for this payment type. If you prefer to leave this field blank, you may assign a credit limit per guest at check-in. "6. Limit per Stay/Day" sets the credit limit entered in Field 5 ("Credit limit amount") per Stay if S and per Day if D. For example, if the credit limit amount in Field 5 is $500, then S in Field 6 will assign a credit limit of $500 for the entire stay and D will assign a credit limit of $500 for each day. NOTE: A "day" begins after night audit Reorganize Files has been run and ends when the next Reorganize Files is run. "7. Credit card?" should be N for any payment code that is not a credit card type. "8. Master folio no." should be blank except for the DEP payment code which is explained in the Advance Deposits section of this document. "9. Central resv code" should be blank unless advised by Execu/Tech. "10. Include in deposit?" should be Y if you want this payment type included in "Bank Deposits" as well as "Payments" on the Cashier Report. N will exclude it from the "Bank Deposits" section but will include it on the "Payments" section. Typically "Bank Deposits" is used to reconcile the cash drawer at shift end. "11. City ledger account?" should be blank unless advised by Execu/Tech. "12. Allow comment entry?" may be Y to allow users to enter a comment when posting this payment type. N bypasses the comment field and defaults to the description for this payment type. Credit card payment types should have N in this field. "13. Display item?" 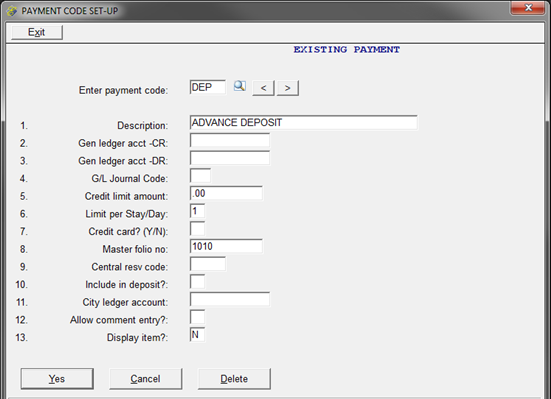 if Y will display this payment type on the Post Charges and Payments (Post Folio) screen. N will not display it. - Advance deposits should be posted using the payment type of the funds received such as CK for Check or VS for Visa. You may have separate payment codes to designate payments received as deposits. For example you might set up CKF for Check-Front Desk and CKD for Check-Advance Deposits Cash or VSF and VSD for Visa. A code used internally must also be set up. This code is DEP and should never be posted by a user. The DEP code is used to "move" a guest's deposit from the advance deposit master folio into the guest's folio at check-in and should always total zero on the payment journal and final recap. It shows up as DEPU on the reports - it posts a debit to the advance deposit master folio and a credit to the guest's folio at check-in. If you are using Execu/Tech's Back Office accounting system you will need to set up DEPU as well as DEP. See hotel-advance-deposits-GL-entries.pdf for details. "1. Description" should be ADVANCE DEPOSIT. "3. Gen ledger acct - DR" may be blank since this is a clearing code. "4. G/L Journal Code" may be blank. "5. Credit limit amount" is not applicable to DEP. "6. Limit per Stay/Day" is not applicable to DEP. "7. Credit card?" should be N.
"8. Master folio no." should be the folio number for the Advance Deposits Master Folio. This is a required field for DEP. "10. Include in deposit?" is not applicable to DEP. "11. City ledger account?" is not applicable to DEP. "12. Allow comment entry?" is not applicable to DEP. "13. Display item?" should be N.
- If you have Execu/Tech's interface to Shift4 or ElementPS for integrated credit card processing, payment codes for credit cards must set up in a specific way. When you enter a credit card payment type, you will be required to process the credit card within the system. Therefor, you also should set up payment codes for off-line credit cards so that you can enter transactions when unable to process credit cards - for example if your internet is down and you will post the transaction directly to Shift4 or Element Payment Services. "Enter payment code" up to four alphanumeric characters. the first two characters must be UPPER CASE letters. See List of Codes for pre-defined codes and special notes. If you wish to specify the sales outlet or revenue department you may make that part of the code but the first two characters must be the same. For example if you want Visa-Front Desk, Visa-Restaurant, Visa-Deposit, and Visa-Spa you may set up VSFD, VSRE, VSDE, and VSSP. Once these have been set up and you are processing credit cards, you should not change them, as these codes are defined within the credit card interface for correct processing. "5. Credit limit amount" sets the default credit limit amount for this payment type. If you prefer to leave this field blank, you may assign a credit limit per guest at check-in by preauthorizing a specific amount at check-in. "7. Credit card?" should be Y for any payment code set up for a credit card processed through Execu/Suite using Shift4 or ElementPS. If you do not have Y in this field then credit card processing will not work properly. "8. Master folio no." should be blank. "12. Allow comment entry?" Credit card payment types should have N in this field. Users should not enter anything in the "Ticket" or "Reference" or "Comment" field when processing a credit card. These fields are used internally for authorization and tokenization information. NOTE: Your hotel payment codes for credit cards must match those in the credit card configuration. To access that configuration, go to File > Special > Run Program by Name: MENUS4CO and press OK. Customers using Element PS instead of Shift4 will run MENUEPCO. Then At the printer selection menu just press Enter. When the configuration window opens, go to the Card Types tab to view the Hotel Codes for each card type. DO NOT change anything in the credit card configuration without checking with Execu/Tech first. - If you have Execu/Tech's interface to Shift4 or ElementPS for integrated credit card processing, you also should set up payment codes for off-line credit cards so that you can enter transactions when unable to process credit cards - for example if your internet is down and you will post the transaction directly to Shift4 or Element Payment Services. "Enter payment code" up to four alphanumeric characters. See List of Codes for pre-defined codes and special notes. These codes should NOT begin with the same two letters as the codes for credit cards. We suggest OC** for off-line credit card postings. Examples: OCVS, OCMC, OCAX. "7. Credit card?" should be N for off-line credit cards. CA and CA* Cash payment codes should be CA or the first two characters should be CA. You may have more than one Cash payment code such as CAFD and CARB. You may use CA or CA* for checks, traveler checks, etc., or you may set up separate codes. CK, TC, etc. You may use CA or CA* for checks, traveler checks, etc., or you may set up separate codes such as CK or TC. CITY CITY is hard-coded for special circumstances and should not be used. Credit cards Credit card payment types MUST match the settings in the Shift4 or Vantiv interface if you're using integrated credit card processing. You may have more than one code for each credit card but the first two characters must be the same. Example: VSFD and VSRE. Suggested codes are VS**, MC**, DS, AX**, DC** for Visa, MasterCard, Discover, American Express, and Diners Club. Off-line credit cards Off-line codes should NOT begin with the same letters as the payment codes for the credit cards. Suggested codes are OC** such as OCVS, OCMC, etc. DEP/ DEPU - Advance Deposits DEP is a required payment code used internally for advance deposits used. DEPU is required if you use Execu/Tech's Back Office accounting and wish to post advance deposits to General Ledger. Both of these codes should be set to "N" for "Display". These codes should not be posted manually. 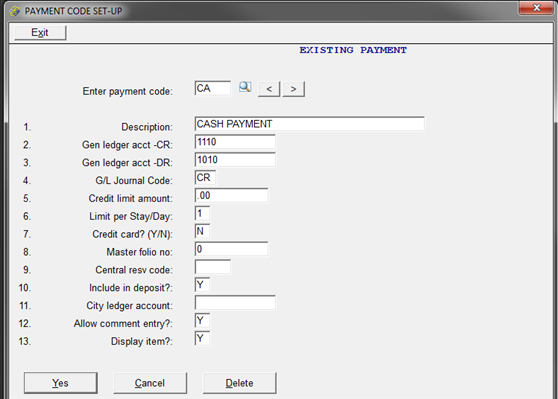 DB DB is a required code for Direct Bill (Accounts Receivable City Ledger). GC* Used with Execu/Gift. If you are using Execu/Gift please read the Gift Card Setup Guide before assigning codes. SECU This code should never be used unless explicitly advised by Execu/Tech. **** You should never use the description SECURITY DEPOSIT unless explicitly advised by Execu/Tech. REF REF is a charge code applied to a Guest Refund that is to be handled outside Front Desk such as through A/P. This code is NOT for normal refunds such as crediting guest payments. Payment credits should be posted using actual payment codes such as VS. Charge Codes No code set up as a Charge Code should be used for a Payment Code. No code set up as a Payment Code should be used for a Charge Code. Make sure to look up required or restricted payment codes before creating new charge codes.